Food coloring demo. One of several 10th grade science activities you can do next period. Fill one beaker with ice water and another other with hot water. Put a few drops of food coloring in each and watch what happens. Your 10th graders will notice the hot beaker mix much faster. Hmm…why? It’s because the those hot water molecules have more energy and move faster, which is what “stirs” the coloring quicker. Pretty cool, huh? Fill a beaker with room temperature water. Then fill a dropper with food coloring and use it to inject a pool of coloring at the bottom of the beaker of water. Since coloring is more dense than water it’ll stay there. Now hold the beaker just over a lit candle and let your 10th graders observe the stunning convection currents that form. Just below is a video of this activity. Click ‘play’. 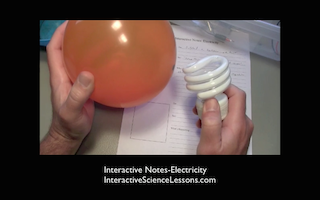 A static-charged balloon lights up a fluorescent bulb! For this one all you need is a balloon, a fluorescent bulb, and some hair. Turn off your classroom lights then ruin someone’s good hair day by charging the balloon on their hair (isn’t revenge sweet?). Bring that charged spot up to the bulb and watch it flicker! What’s happening? The gases inside the tube are, true to their name’s sake, fluorescing due to the tiny bit of static electricity present. Below are LOTS more cool science activities you can do with your 10th graders. 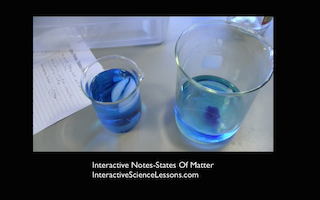 Looking for Science lessons that are meaningful & fun? Click a tab and title below!